Transmissions creates an aural environment defined by white noise as broadcast by 16 mounted antennae-like metal spires positioned within a contained location. The sounds of cosmic radiation, sun spots, encryption anomalies, and more are all interwoven by the spires to create a unique environment defined by audio frequency radio waves such as tweaks, crackles, and swishes, bringing previously unheard sounds to the forefront of consciousness, inviting participants to acknowledge and experience their aesthetic nature without subconscious filters. Through the creation of this new environment within a previously existing location, participants will be encouraged to recognize the reality of the myriad spaces around them, and the many possible futures that those spaces offer. SubZeroArts is very pleased to announce that our latest installation Transmissions will be presented by New Adventures in Sound Art at NAISA North Gallery in South River. Transmissions is a multi-point sound art installation that uses a collection of touch-sensitive antennae to trigger abstract sounds and tones, creating a unique sound environment for audience participants to explore. We’re thrilled to be working with NAISA again, and we hope that you’ll come out and see Transmissions if you’re in the area! SubZeroArts is very happy to announce that our latest installation “Transmissions” will be on display from February 27th to March 20th as part of Art Souterrain in Montreal, Quebec. SubZeroArts is very happy to announce that our latest installation “Cubism” will be on display at the outdoor music and arts festival Camp Wavelength taking place August 28th to August 30th at Artscape Gibraltar Point on the Toronto Island. “Cubeism” is a new installation for Camp Wavelength that uses light and sound to inform a location, creating a soothing new space to explore. We think it’s perfect for an outdoor event like Camp Wavelength which sounds to us like the best show of the summer. SubZeroArts returns to Nuit Blanche Ottawa-Gatineau for 2014 with the debut of their latest video presentation “MNML” — a visual poem blending oblique imagery and transcendent soundscapes designed to lead viewers through a unique terrain and inspire the imagination. Bypassing the normative textural structure of poetry, “MNML” replaces text and language with a visual narrative, simultaneously leading the audience through a sensory experience while encouraging visitors to imprint their own personal meaning on their journey. Through the creation of a visual literature, “MNML” will inspire and captivate audience members of all ages. Combining generative video and sound art, “MNML” will immerse viewers in a unique visual/aural space directed by their own imagination. Join SubZeroArts at Nuit Blanche Ottawa-Gatineau on September 20th, 2014 and experience the visual poetry of “MNML”. InteractiveArts, SODI Designs and SubZeroArts are proud to present “Icedrops” — an interactive light installation that will be on display at Ottawa’s Winterlude 2013 as part of the IllumiNation: Outdoor Light Art Gallery February 1 – 18. “Icedrops” features a series of large suspended sculptures that instil a clean opaque architectural beauty during the day, and become bioluminescent light-art during the night. SubZeroArts assisted with the light design for the sculptures, and we also provided a soundtrack taken from our installation “LightSoundPlay!“, which we presented at Club Saw in September 2012 as part of Nuit Blanche Ottawa. We’re very excited to be able to collaborate on “Icedrops” with InteractiveArts and SODI Designs at Winterlude 2013, and we’re thrilled to be able to share this new work with all of our friends in Ottawa! 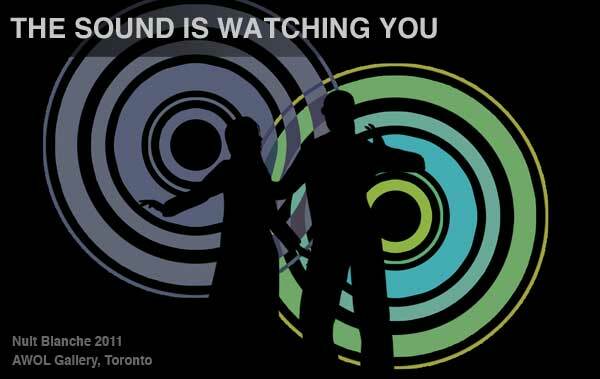 SubZeroArts’ installation “The Sound is Watching You” will be displayed as part of New Adventures in Sound Arts’ annual Art’s Birthday Celebration at Artscape Wychwood Barns in Toronto, Ontario from January 17 to February 18, 2013. “The Sound is Watching You” is a surround-sound and visual experience that responds to audience participation, where audience movement is transformed into a symphony of constantly morphing and re-generating music and light. In keeping with SubZeroArts’ ideal of audience interaction, “The Sound is Watching You” is a multimedia experience that’s fun and engaging for audience members of all ages. Art’s Birthday is an annual event which began in 1963 by French artist Robert Filliou to celebrate the presence of art in our lives. It has since been celebrated on January 17 as an annual exchange-art event by a collection of artists and artist organizations around the world. Happy 1,000,049th Birthday, Art! Join us on September 22 in Ottawa for Nuit Blanche at the SAW Gallery! 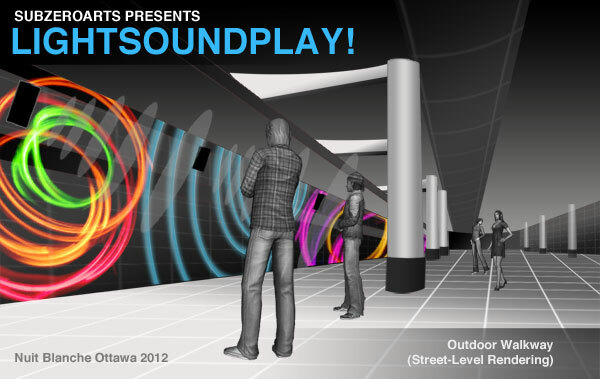 SubZeroArts is thrilled to present “LIGHTSOUNDPLAY!” as part of Ottawa’s inaugural Nuit Blanche all-night event! Starting at 6:20PM and ending at 6:20AM, Nuit Blanche Ottawa promises to transform public and private spaces of participating Ottawa neighbourhoods creating temporary night-time galleries and performance spaces. On Saturday, September 22, 2012, thousands of people will attend Ottawa’s very first Nuit Blanche, to witness a city pulsing with color and creativity. LIGHTSOUNDPLAY! is an interactive experience in video and surround-sound that feeds on audience participation. As you move, your movements are transformed into a blend of light and music that constantly re-generates, morphs and envelops you. A symphony of evolving visuals and sound… all created by you! Join us on September 22nd at CLUB SAW / SAW GALLERY (67 Nicolas, Ottawa) and experience LIGHTSOUNDPLAY! for yourself! From the depths of the Mariana Trench comes “DarkLab” — a reactive sound/sculpture installation presented by SubZeroArts team-members Deane Hughes and Christine Beaumont. Using positioning and sound-sensor technology, the artifact “senses” and “reacts” to the presence and movements of on-lookers while immersing them in a shadowy, surround-sound audio-environment. 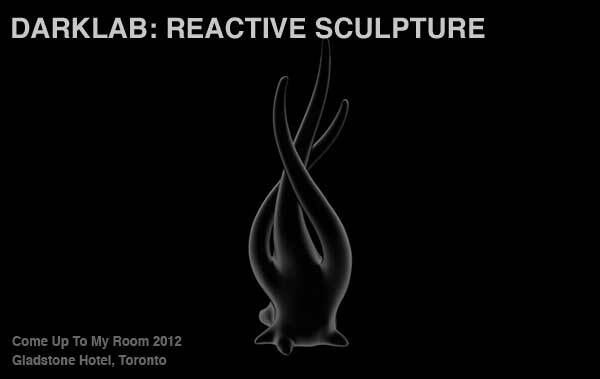 By combining the audience’s motion and proximity to the artwork with a multi-source soundscape, DarkLab is a unique, participatory experience in tactile sculpture-art that connects individuals with the installation in unexpected ways. Come Up To My Room is the Gladstone Hotel’s annual alternative design event inviting artists and designers to show us what goes on inside their heads. Coming together in dialogue and collaboration, participants are limited only by their imaginations, making CUTMR one of the most exciting shows in Toronto. “The Sound is Watching You” is a sound/art installation designed exclusively for Scotiabank’s Nuit Blanche 2011 taking place from sunset to sunrise on Saturday, October 1st 2011 at AWOL Gallery in Toronto, Ontario. Developed and constructed by SubZeroArts, “The Sound is Watching You” is a unique experience in light and sound that feeds on the movements of the audience. As you enter, your motion is transformed using echolocation technology and generative computer graphics into a blend of light, video and 3D audio art. Constantly re-generating and morphing, you will become an instrument of light and sound that will create an evolving art piece. You aren’t just looking at art in “The Sound is Watching You”, you are the art! Scotiabank Nuit Blanche 2011 brought together the exceptional talents of more than 500 artists and curators, dozens of galleries, museums, cultural and educational institutions and neighbourhoods, 500 volunteers and 25 corporate sponsors and media partners. The event attracted both local and out-of-town audiences, with an estimated attendance of one million including more than 120,000 out of town visitors.